Back-country trails from the Appalachian Mountain Club’s Little Lyford lodge in Maine have views of Baker Mountain. Natural snow and 80 miles of groomed trails (without set tracks) run between and around two lodges, Little Lyford and Gorman Chairback. (A third lodge, Medawisla, is closed for renovation and will reopen in January 2015). Guided or self-guided trips are offered, along with dorm-style bunks or private cabins, wood fires, hot showers and saunas, and home-cooked meals. For intermediate and above skiers only. (For hiking and snowshoeing, AMC also opens three of its New Hampshire huts in the White Mountains during the winter: Lonesome Lake, Carter Notch, and Zealand Falls. The first two are accessible by snowshoe and are not cross-country ski bases, but experienced skiers can get to Zealand Falls. 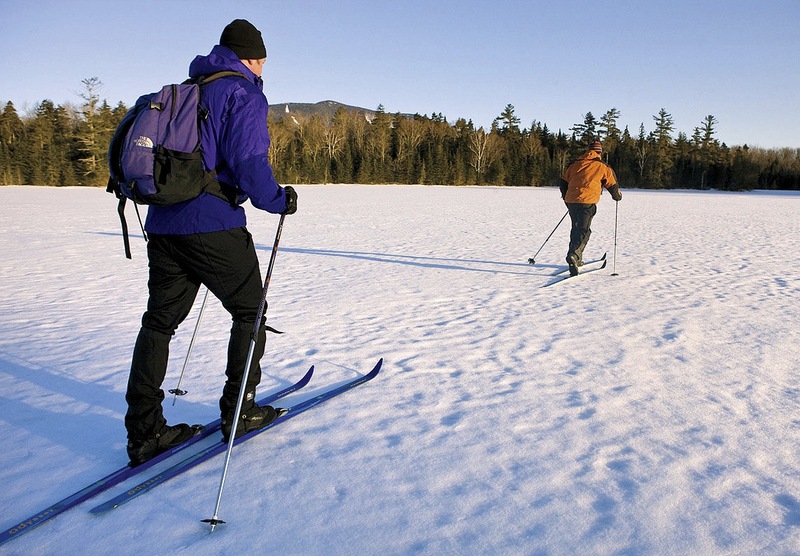 The longest cross-country trail in North America, this diverse route for skiing and snowshoeing includes groomed sections, logging roads, and snowmobile trails that traverse private and public land, such as the Green Mountain National Forest. Options include half-day and day-long trips, skiing from inn-to-inn, and winter camping. Craftsbury has 65 miles of trails that traverse quiet woods, fields, rolling hills, and villages—most with stunning mountain and other vistas—along with comfortable lodging, lessons and ski rentals, and family-style meals made mostly from food grown on site or procured from other Vermont organic sources. Ski races and training sometimes dominate, so plan accordingly. A free shuttle to nearby Highland Lodge means that skiers can also experience a day’s worth of other trails. This nonprofit community-based organization oversees about 95 miles of interconnected trails for skiing and snowshoeing. The trails not only link visitors with an array of inns and restaurants in and around the village of Jackson (just north of Conway), but also extend far beyond—to other routes through pristine rural land, including those of the Appalachian Mountain Club and backcountry trails in the White Mountain National Forest. Ski lessons and rentals, as well as a racecourse, are also available. This nonprofit organization’s mission is to offer year-round, responsible access to the beauty and serenity of Maine’s lakes, rivers, and forests in the western mountain region. Self-guided and guided tours are available and can be based at one hut, or involve travel among the four huts, which offer heated (60 degrees) bunks, three square meals, wine and beer, showers, composting toilets, and libraries of books and games. This large, full-scale, year-round resort offers a range of Nordic (and Alpine) trails that cater to recreational skiing and racing and guided tours, along with a ski school and a variety of dining and lodging options. The multitude of children’s activities include a snowmobile park.